I’ve written before about slimming Time Machine backups. Without careful pruning of the system, developers can find that their Time Machine backups become huge. For instance, if you’re developing Rails apps, you’ll likely want to not back up your logs directories. And everyone will probably want to exclude up their Cache directories, which of course are scattered throughout the system: I’ve counted /Library/Caches/, /System/Library/Caches/, and ~/Library/Caches/; and this doesn’t cover specialised caches you can find in */Library/Application Support/, for instance, for Flash. Remember this location, and note the asterisk: these become important later. Well, since I’ve slimmed my Time Machine backups, I’ve noticed the occasional baffling 450MB or so backup in the morning, and periodically throughout the day. I couldn’t figure out what it was—remember, Apple doesn’t let you know what you’re backing up—and I was really worried that someone had broken into my machine and was using it to relay something really unsavoury. Enter Time Tracker by Charlesoft, the author of Pacifist (I’ve since discovered BackupLoupe, which does much the same thing). Time Tracker is a very basic app that lets you view what, specifically, has been backed up, and how big it is. It’s a big help, and it helped me identify the culprit: Roxio’s Retrospect, which I use to create monthly backups of my work. It turns out that even if you aren’t using it to back up your entire system, Retrospect creates a huge tally of your work. It’s located in /Library/Application Support/Retrospect/ and for me at least the files there tally usually in the region of 400–600MB in size. Which is backed up periodically throughout the day by Time Machine. 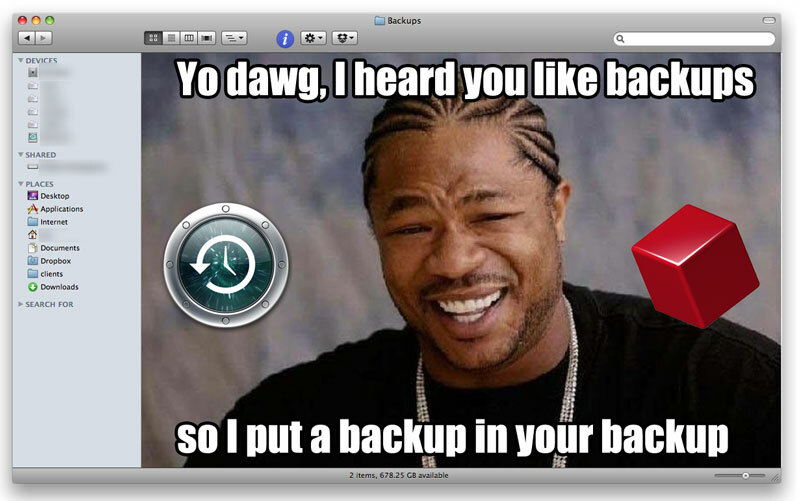 Yes, the backups are backing up the backups. It’s backups all the way down, people. I’ve never actually seen his show, but I giggle at the recursion jokes every time. So, uh, if you’re paranoid like me & use Retrospect for monthly backups (because, you know, hourly backups aren’t enough), then you’ll want to exclude this from your backups. Since then, my backups are a lot saner in size, and my backup drive is no longer filling up with alarming speed.